Newly furnished, commanding views, gas fireplace, fabulous kitchen, the list goes on and on! This Snowmass villa has 4 bedrooms, and 3.5 baths for your family to enjoy and couldn't be more comfortable. The master suite occupies it's own floor and takes in some of the best views on the mountain looking out at the resort and all the way to the town of Crested Butte! So bring everyone along. With sleeping for up to 9 and picture windows framing stunning views in every room, you can't go wrong with this vacation rental. Entering this property you can't help but look through the living room to the massive picture windows looking out over the ski resort. The covered deck on this level has outdoor seating and couldn't be a better place to watch the fireworks at 4th of July and New Year's Eve! The open floor plan means everyone is a part of the action at the end of the day to swap stories about the best hike, ski run, or fishing hole. The living room is anchored by the oversized leather sectional and boasts a river rock gas fireplace and large flat panel TV. WiFi throughout the home means everyone stays connected. The owners thought the dining room needed to be a place for gathering and fun so a custom log table with bench seating anchors the space. Step into the fully stocked kitchen and whip up everything from a bowl of cereal for breakfast to a 7 course meal for dinner. Downstairs you will find 3 bedrooms and 2 baths. The junior master has a sumptuous king bed custom made of logs. The en-suite bath has an over sized jetted tub for soothing those tired muscles at the end of the day or a large shower, along with dual vanities. Down the hall is two bedrooms and a full bath. One bedroom has a fun trout fishing theme and has a twin day bed with a pull out trundle for extra sleeping. The other bedroom has custom log bunks that have a queen bed on bottom on a twin on top. All bedrooms feature flat panel TVS. On the second floor above the living area you will find the massive owners suite. It takes up it's own floor and has a beautiful king bed, gas fireplace, and private deck. The vaulted ceilings add to the open feeling and make this a special bedroom. The en-suite bath boasts vaulted ceilings as well with a large shower and bathtub positioned beneath picture windows taking in the fabulous views. The one car attached garage is a great place to store all of your bikes, skis, fishing gear, and all the other toys that make vacation fun! With only a 7 minute walk to the base area, this villa couldn't be more convenient. So pack your bags and let this fun vacation rental be your home base! FUN FACT! The owners provide a FREE ski locker at the base near the ski lift for guests to use. It includes a lounge area with TV, microwave, fridge, bathroom, benches, boot warmers, and boot, ski, board, and pole storage. No need to haul your equipment back and forth each day! My husband and I stayed in Mountain Dreams house with 7 young adults and teenagers. Can't say enough about this house. One of the best equipped houses we have ever stayed in before. Great location. Very comfortable for everyone. We actually felt like we were at home. We have stayed a lot of places and this was by far the best. It had everything you need and then some. Not like in most places, just the bare necessities. It was great. It Was wonderful working with you all. You made it so easy. We recently stayed at this house for a 5 day ski trip as part of a group of 8. The amount of rooms and space in this house made it very comfortable. They had great amenities in the bathrooms and kitchen. My only suggestion would be a better broom and dustpan. The walk to the ski base is about 7-10 minutes and a little uphill but not difficult.The ski locker is very convenient but it will only hold about 3 adult skis and maybe a set of kids skis with boots. The condo was very clean and when we had a few mechanical issues they were addressed immediately. Overall I would recommend this place. Stocked shelves and pantry. The ski locker near the slopes was a HUGE benefit -- our neighbors were envious. Absolutely perfect accommodations for our group. Master suite upstairs. Another master suite downstairs for the younger couple, with a bunk room for their kids just down the hall, and a guest room for their visitor from California also on that level. And the main living area was perfect for all of us. We felt confident every step of the way that things would be all set up for our arrival, and we were right. No worries; that's always a good thing. Clean, tastefully set up, everything we needed in a great base from which to explore the area. Clean, beautiful views - we loved it! The "agent" made checking in a pleasure. Very helpful in every regard. The home is very nice and the owners have done everything possible to be gracious hosts. They clearly respect their guests, and therefore it's a pleasure to respect and enjoy their home. Thanks all! This was a great location at Mt Crested Butte. Very spacious and well stocked. Bedrooms and bathrooms were very large for a ski condo. Amazing views of the mountains from the patio. We stayed with 5 adults and a child and had ample space. Overall, we loved it and would definitely rent the same property again. Loved the layout of the condo with its 3 stories. Was also very nice to have 2 master suites. The location was great and the locker was such a huge help. The house was fully equipped and had everything we needed. Would definitely stay again. Overall experience with booking a place was easy and the communications about the property was ongoing and easy to understand. The property we stayed at in Crested Butte was great. It was very clean and equipped with all we needed. Would definitely stay there again. Katy was so helpful at the beginning & made everything go smoothly. Having the binder at the property provided additional info that was great to have. The property was just beautiful. The house was just gorgeous & was beyond what we ever expected. We traveled with our son & his family & the accommodations worked out wonderfully. We cant wait to visit again. Thanks again for making our vacation so great. Everyone I talked to was helpful in every way. When we arrived a few minutes early the young man taking out the garbage let us in and welcomed us. When we ran out of paper products he brought more to us the same day. Katie even delivered a medication we ordered and had sent to the office since Amazon would not deliver to the house. Our exit routine was minimal which allowed us to make a early start to our trip home. Thanks to you all. We enjoyed using the bike path to town nearly every day. Access to hiking and biking trails was convenient. The kids used the amenities across the street at the adventure park. We loved everything being so close together that we rarely used our cars. We felt confident every step of the way that things would be all set up for our arrival, and we were right. No worries; that's always a good thing. More than we expected. Stocked shelves and pantry. The ski locker near the slopes was a HUGE benefit -- our neighbors were envious. Absolutely perfect accommodations for our group. Master suite upstairs. Another master suite downstairs for the younger couple, with a bunk room for their kids just down the hall, and a guest room for their visitor from California also on that level. And the main living area was perfect for all of us. It Was wonderful working with you all. You made it so easy. We have stayed a lot of places and this was by far the best. It had everything you need and then some. Not like in most places, just the bare necessities. It was great. We would love to stay in it again. This team is top-notch. I received a great email before check in and all of the information we needed about this awesome vacation home. I had a very small issue with the coffee pot and within hours the management company had delivered a new coffee maker. They were super polite and accommodating and wanted to know if there was anything at all they could help me with. Iron Horse is a seriously professional and first rate company. I recently stayed in the Mountain Dreams house on Mt. Crested Butte with my husband, 2 sons and my parents who are seniors. This is an amazing property that works great for families and large groups. It's spacious and comfortable with breath taking views of Mt. Crested Butte from both of the large decks. There's lots of room for socializing and togetherness and yet plenty of space to retreat to for quiet time - especially the 3rd floor master bedroom which offers lots of privacy and it's own covered deck facing the mountains. The spotless kitchen has every utensil, gadget and appliance you might use in your own kitchen. This place has a garage which was great for us because we had 6 mountain bikes and all of our equipment to store. The garage made it really convenient to come home from a long day of riding, park our bikes, shed our gear and head inside for a fun evening of food, games and movies. The King size beds in both the upper and lower masters are super comfortable - even my 75 year old dad who doesn't tend to sleep well had a good rest every night! My kids loved the bunk bed room, which has it's own TV and morning views of the mountains. I can't say enough great things about this house - it's such an amazing home with large rooms, great decorations and a homey feel. The owners have gone to great lengths to make sure everything is convenient and easy for their guests. The house is just a short walk or bike ride to the ski resort and the bike path that leads into town. 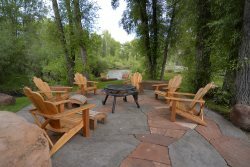 My entire family had a great time and we would absolutely recommend this home to anyone traveling to Crested Butte. We will definitely stay here again!